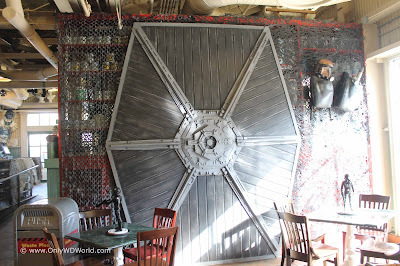 New for 2015 at Star Wars Weekends is another Star Wars themed dining experience for fans to check out and this one is geared for the adults in the crowd. 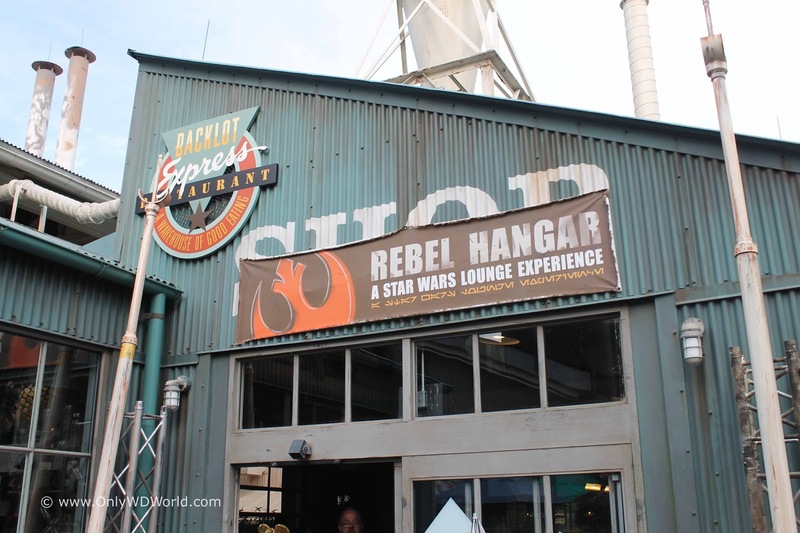 This marks the 3rd different dining experience available for guests of Disney's Hollywood Studios during Star Wars Weekends. 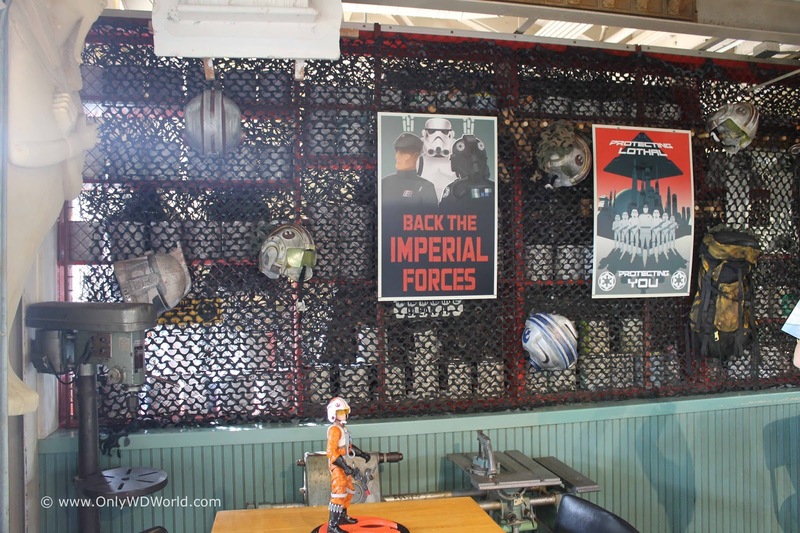 Disney Imagineers have done a quick makeover to a section of the Backlot Express quick service dining location that can be found between the Indiana Jones Stunt Spectacular and Star Tours. 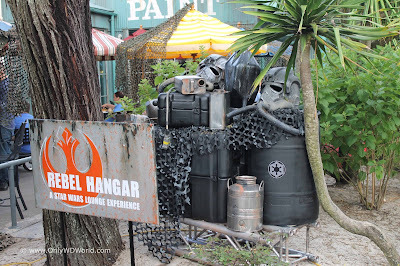 They have taken an area that was supposed to be a studio backlot area with a bunch of excess props left behind and added a Star Wars feel to the area. There are posters on the walls that encourage folks to join the Imperial Forces and Rebels themed items on the tables. With just a few items, the transformation gives the area a great Star Wars look. 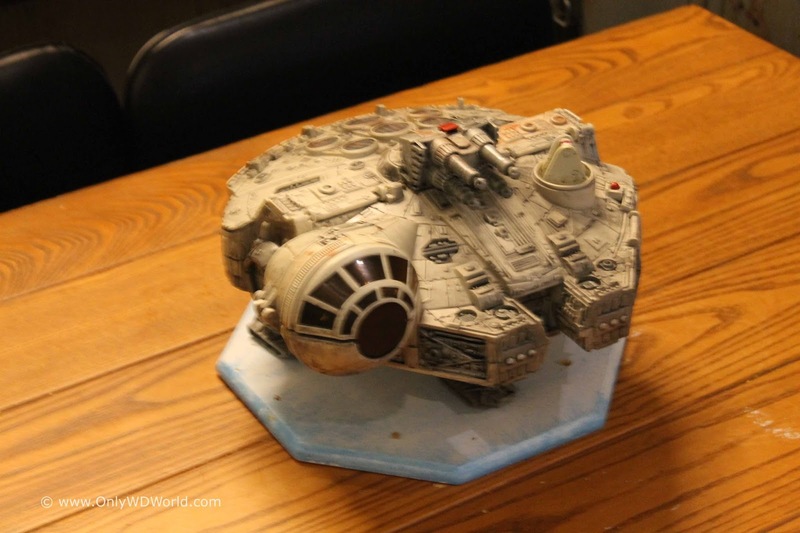 The above pictures give you a sense of the transformation. 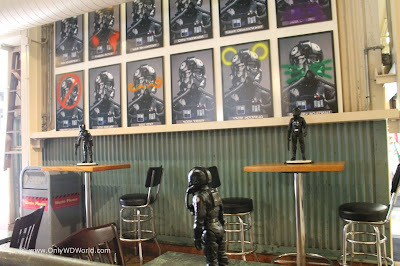 The menu has a selection of small plate items and drinks that are befitting a lounge atmosphere. 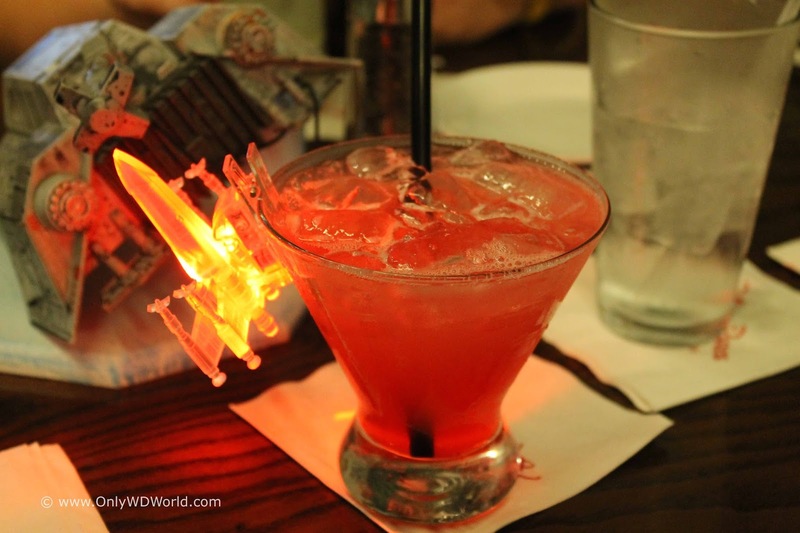 The light up X-Wing fighters add to the appeal of the specially named drinks like: Rebel Red, Imperial Blue, Degobah Swamp Juice, & the Tatooine Sunset. 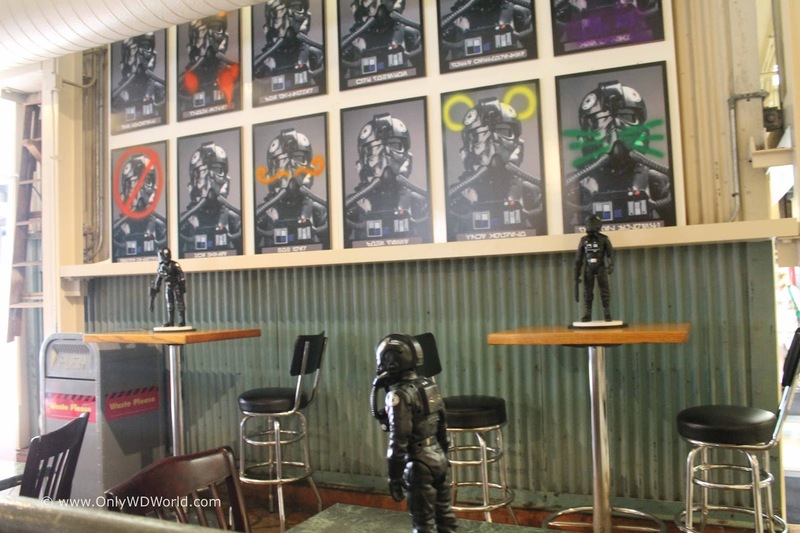 The menu is small, but there is a good variety of small plate offerings. 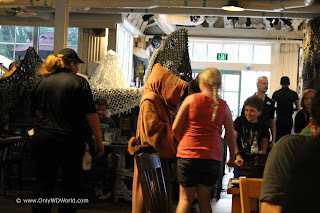 During our review we tried 4 of the choices: Lightsaber Bites, The Dark Fried, The Sith & The Jedi, and Chips & Sith. The Chips & Sith was certainly the most visually appealing dish on the menu so we had to try it. 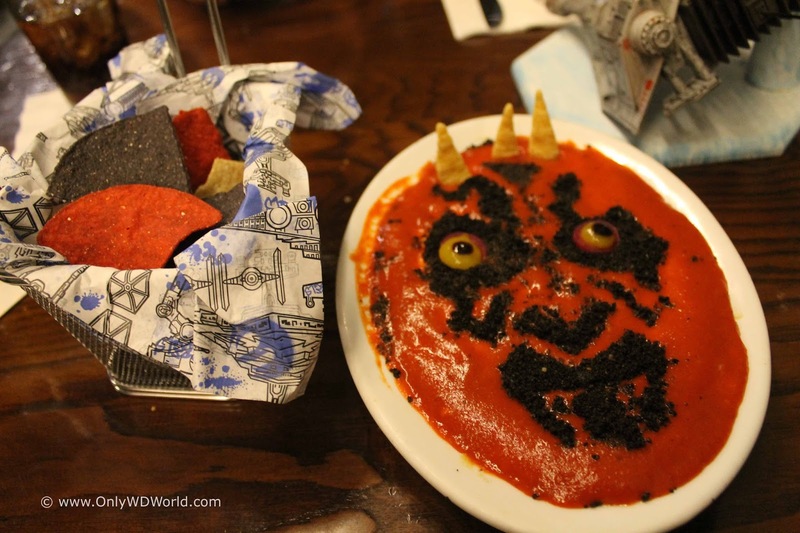 The Darth Maul looking hummus based dip not only looked great, but tasted pretty good also. 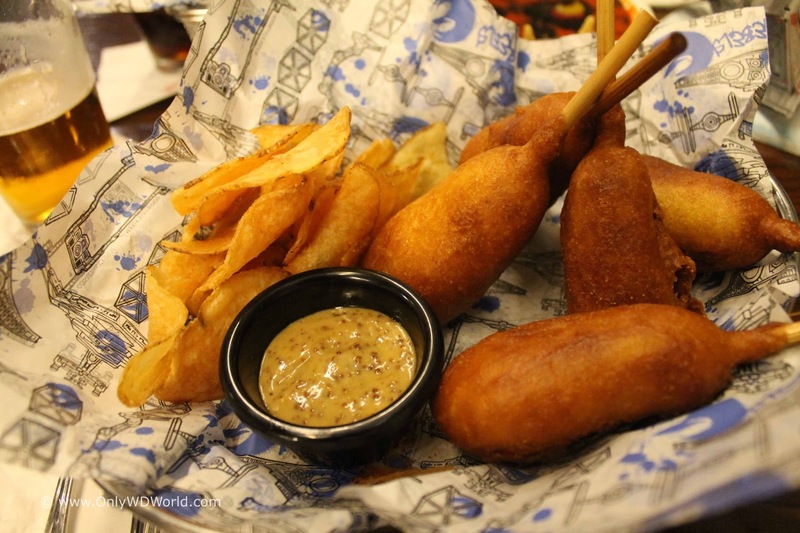 The next favorite were the Lightsaber bites which turned out to be an upscale version of corndogs that were cooked perfectly,served hot and went well with the accompanying mustard dipping sauce. The Dark Fried was a Disney take on Chicken & Waffles that was good, but not exceptional. The last dish that we tried was the barbecued pulled brisket and barbecued pulled chicken sliders. 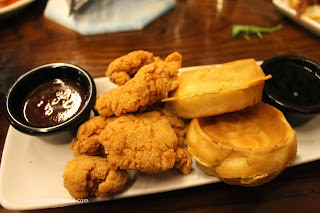 Again these were good, but not overly memorable. 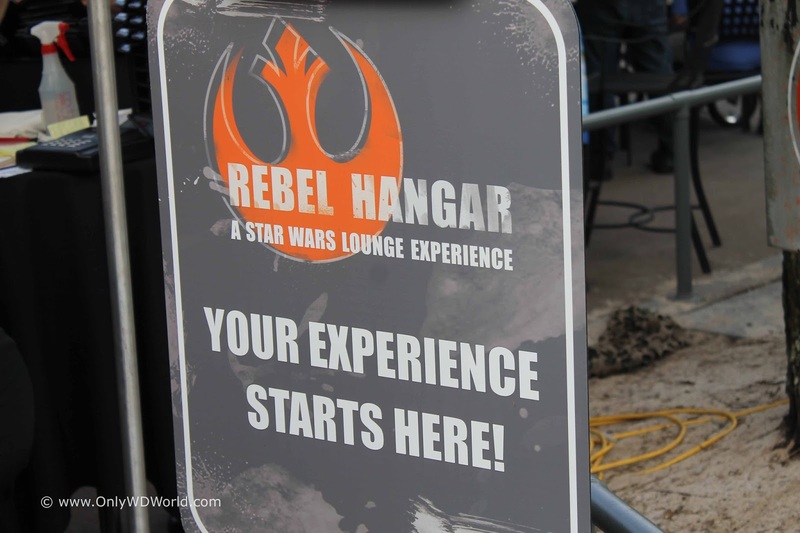 The experience is the key to the Rebel Hangar. While we dined we saw Greedo, a Jawa, and from Star Wars Rebels - Ezra & Sabine walking around. 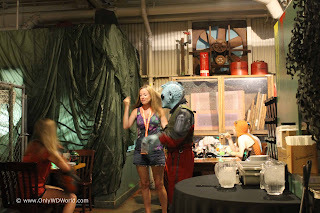 Unfortunately it was not like a character dining experience where they went from table to table and stopping to interact with guests and pose for pictures. 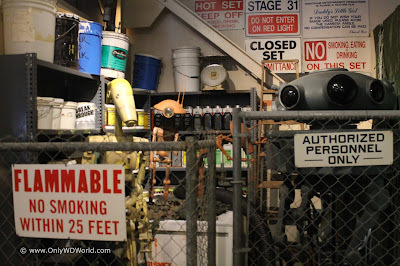 They would oblige if you stopped them as they went by, but they acted more like patrons of the Lounge and milled about. 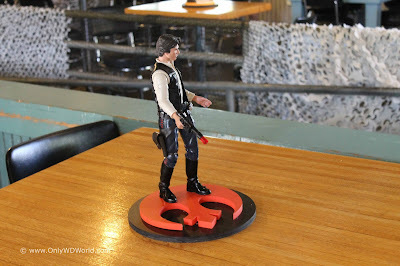 The food was good, if not great, but we enjoyed the creative names and attempt to make them related to Star Wars. 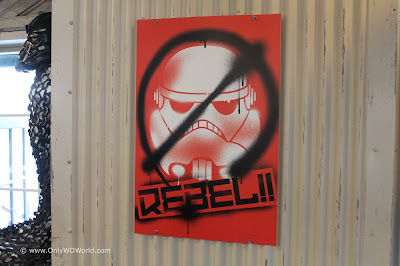 The best result was certainly the Darth Maul looking Chis and Sith. 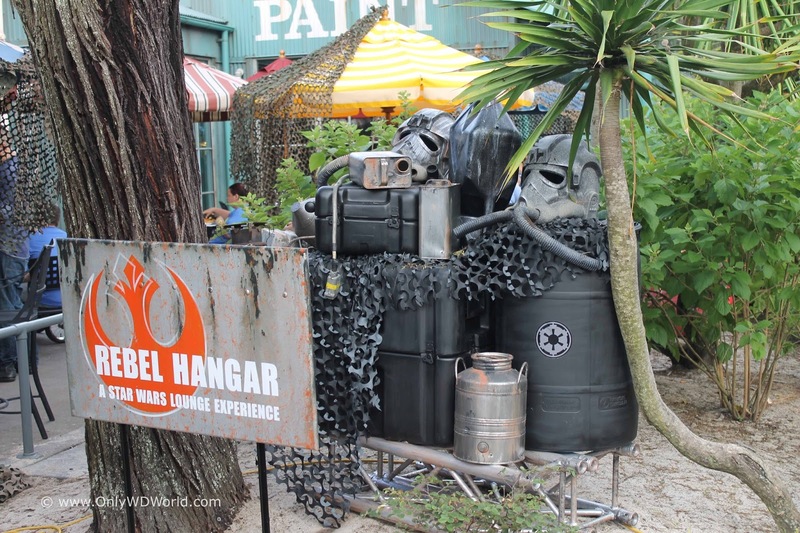 The props that had been included in this area looked great and helped make the area fun for the Star Wars Weekends guests. The fact that the waitstaff did not push the food and drinks overly hard was great. 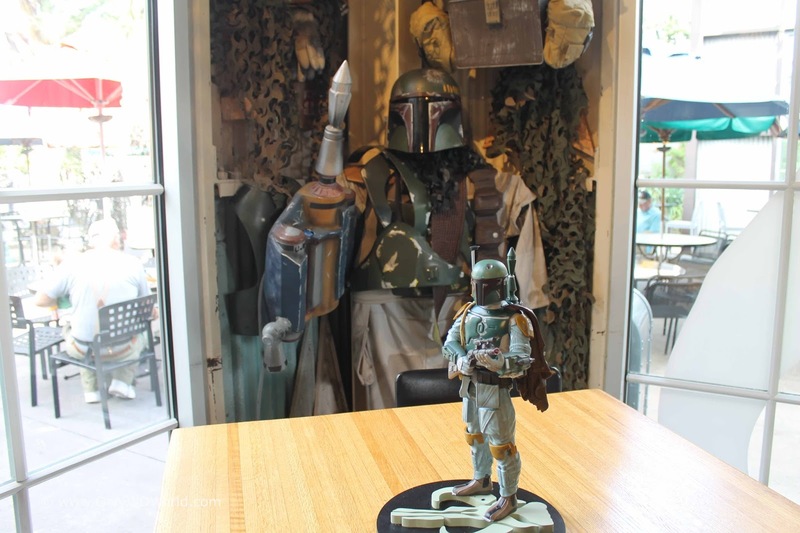 By that I mean that several tables got one round of drinks and maybe one appetizer for the table to split and that was it. They were there see the Lounge and to enjoy the atmosphere. 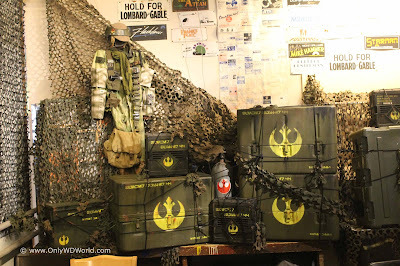 In that respect the Rebel Hangar delivered. All in all if you went in looking for a fun, Star Wars themed extra thing to include as part of your Star Wars Weekend then this is definitely something worth checking out. 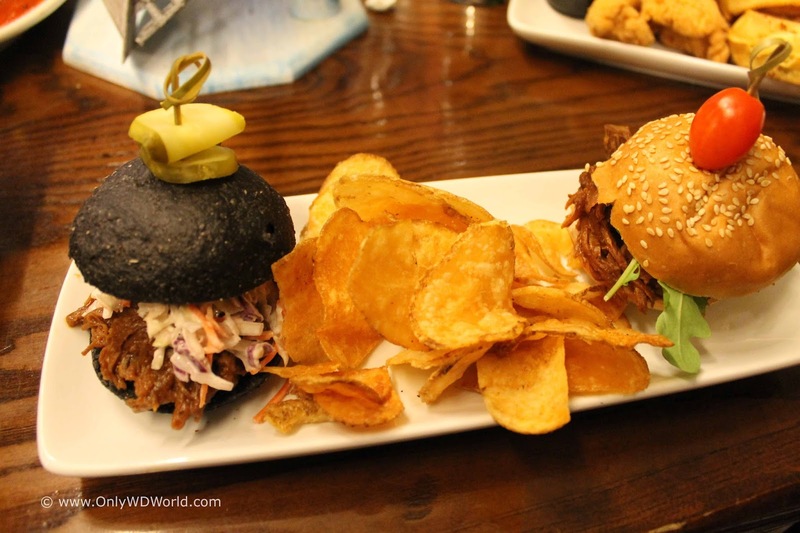 If you are expecting some of the best culinary options that Disney World has to offer then this isn't for you. 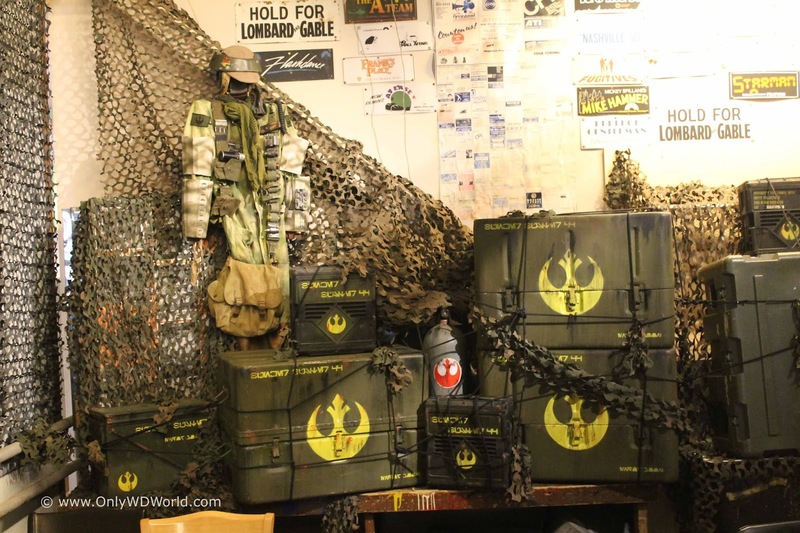 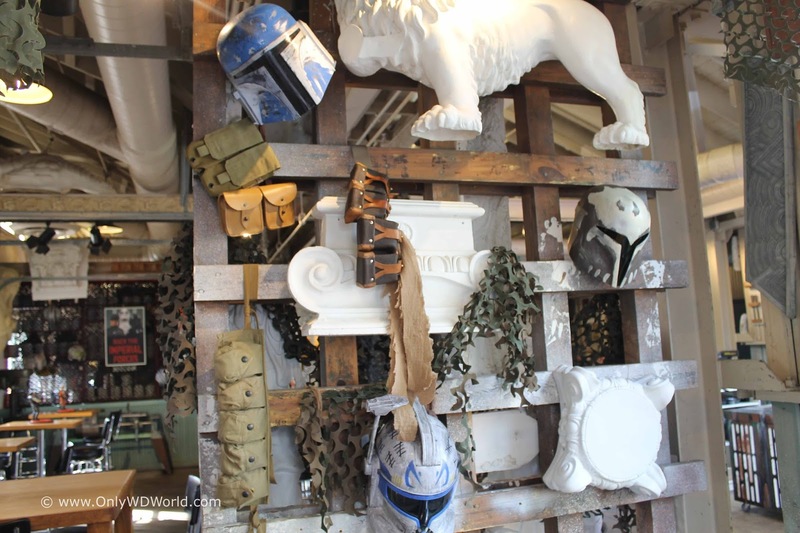 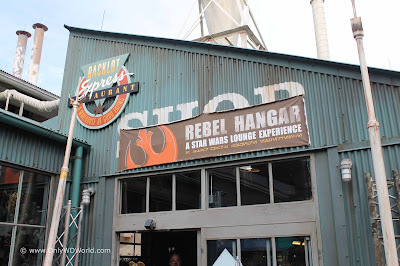 0 comments to "Star Wars Weekends: Rebel Hangar Lounge REVIEW"